And somewhere along the line we realize that just as you can’t judge a book by its cover, you can’t judge food by its taste. We know that taste can be misleading, at least when it comes to what’s best for us. People love donuts, but they don’t make a nutritious breakfast. Spinach isn’t popular with many people – especially children – but it’s beneficial to our health in many ways. But for me, a great meal is less about what you eat than how you eat it. 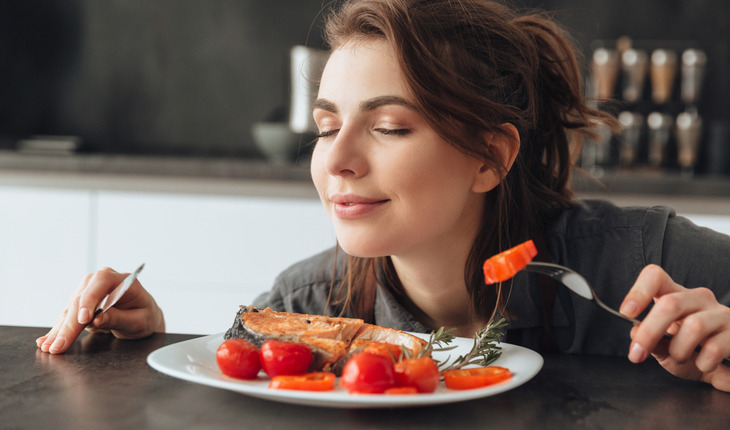 I advocate something I call “intuitive eating” that’s aimed at improving every dining experience – and perhaps making for a healthier diet along the way. Taste food as you chew. You may think you already do this, but too often people don’t really take time to enjoy the taste. They wolf down their food so they can move on to whatever is next on their agenda. Tasting food helps your body relax and digest more efficiently. Tasting and savoring what you eat also is good for overall health. Be thankful for your meal. Giving thanks doesn’t have to be limited to Thanksgiving. Think about what food is giving you: energy, strength, health, nourishment and pleasure. If you take a little time to meditate on that, your body will relax and you will get more nourishment from your food. Give your stomach time to inform your brain. It takes 15 minutes before your brain gets the message from your stomach that you’ve eaten. That’s no doubt one reason people over eat. They don’t give their body time to get the message that they are getting full before gulping down even more food. Take time to have conversations when you eat and you will eat less – and enjoy the meal more. Eating is a necessity of life. But there’s no need to rush things. Eat just enough to feel good and trust that hunger will return and another meal will be found. Jane Bernard, author of Lucid Living in the Virtual Age (https://www.sensualthinking.com) and other books, is a philosopher and educator who writes and teaches about intuition and sensual thinking. She has appeared on TV and international radio, talking from the intuitive perspective. Jane introduced her first book, Fine Tuning, on The Montel Williams Show, in 2006. Her easy-going combination of common sense and originality is a natural eye-opener.